Allaah allows trials and tests to occur in order to distinguish the truthful one from the liar, the true believer from the hypocritical liar, and the good one from the wicked one. This is part of Allaah’s [perfect] Wisdom. Trials will come to pass upon the people as a result of this [perfect] Wisdom. If trials do not occur, then truth will be confounded with falsehood-the believer will be confused for the hypocrite and there will not be a distinction between this one and that one. A person must learn about the truth-its proofs and evidences. He must learn and know what falsehood is and the doubts associated with it, in order that he can be saved from falsehood and warn people against it. How can he avoid and warn people against it if he is unaware of it? And with regards to this, the Qur’aan has clarified truth and falsehood; it has clarified Eemaan and Kufr, Tawheed and Shirk, and Halaal and Haraam. It has not only clarified Tawheed, Halaal and truth; rather it clarified that which is in opposition to them, so that the Muslim can avoid them. Likewise, the Prophet [sallal-laahu-alayhi-wasallam]- in his Sunnah- clarified good and evil, truth and falsehood in all affairs of the religion. The scholars [may Allaah have mercy upon them] clarified – in their written works- what Tawheed, Shirk, disbelief and hypocrisy are. They have clarified the belief of Ahlus Sunnah wal Jamaa-ah and the beliefs of the deviated sects, such as the Jahmiyyah, the Mutazilah, the Ashaa-irah…..and other than that. They have clarified the correct and forbidden [deeds related] to mutual dealings. They have clarified the correct [Islamic] marriage, the false and corrupt marriage and the women forbidden [for one to marry]. They have clarified the [good manners legislated in the sharee’ah] and the evil manners that are in opposition to it. All of this gives the Muslim an insight into his affairs, so that he knows the truth by its evidences, knows what falsehood is and the doubts associated with it, in order that he can avoid falsehood and tell the people avoid it. This is why you find in the books of belief: clarification of the belief in Tawheed and the belief of Ahlus Sunnah Wal Jamaa-ah, clarification of the beliefs [that are tantamount] to misguidance, the doubts associated with it and refutation against it, in order that the Muslim is not misled by beliefs [that are tantamount to] deviation, false beliefs and deviated schools of thought; and in order that the Muslims can be upon a correct understanding with regards to the affairs of their religion and that which is in opposition to it. These [statements are tantamount to] misguidance because Allaah [The Mighty and Majestic] has clarified the truth in opposition to falsehood, guidance in opposition to misguidance and Tawheed in opposition to shirk. Allaah [The Mighty and Majestic] has clarified all the affairs of the Religion- a detailed clarification of the affairs related to worship, mutual dealings and manners. Therefore, this must be clarified in order that it is made clear to the people, [and in order] that they can be upon clarity, and so that the true Muslim is distinguished from the so-called Muslim and no deviation and forgery enters into Islaam. We must make a distinction between this and that one, in order that truth is not confounded with falsehood, and [in order] to distinguish between truth and falsehood, and [between] good and wickedness. We do not suffice ourselves with a general Islaam because this is misleading, and it is deception. We warn against this propaganda. The truth must be clarified and distinguished from falsehood, and guidance must be distinguished from misguidance. Hudhaifah [radiyallaahu-anhu] used to ask the Prophet [sallal-laahu-alayhi-wasallam] about the evil and did not suffice himself by only asking the Prophet about the good. The Prophet affirmed that for him and did not say to him: ”Suffice yourself with knowing what good is’’ rather he [sallal-laahu-alayhi-wasallam] affirmed and clarified- for him- the evil that was to occur, in order that he may beware and warn others. This is the Sunnah; this is the path of the Qur’aan and that of the Messenger [sallal-laahu-alayhi-wasallam]. Al-Jaahiliyyah: It is derived from al-Jahl [ignorance]. It is the absence of knowledge, and the intent behind it is the state of affairs before Islaam. The state of affairs before the advent of Muhammad [sallal-laahu-alayhi-wasallam] is [referred to as] Al-Jaahiliyyah, because the people were in a state of [extreme] ignorance and misguidance in affairs related to worship, mutual dealings, food consumption, marriage and other than that. They were in [extreme] ignorance and misguidance due to the long period between Eesaa and Muhammad [i.e. the absence of a Messenger]. This was a period of over four hundred years in which the divine message ceased. The divine message was obscured, whilst ignorance and misguidance became widespread. The people worshiped idols, trees, stones, false deities, the Jinn and humans. They worshiped the Angels, the Awliyaa and the righteous people, and they were upon divergent paths. And with regards to the affair of halaal and haraam, they did not distinguish between good and filth; rather they used to deal in usury. The usury of the pre-Islamic era of ignorance was that when they settled a debt with a debtor, they would say, ‘’Either you settle the debt, or we increase the debt and double the time it [should be paid].’’ This was the Pre-Islamic Usury and it used to be predominant in their mutual dealings. They used to gather wealth through forbidden means-through pillage, plunder, robbery and devouring people’s wealth through falsehood. And with regards to food consumption, they made dead animals and blood lawful; they used to eat dead animals, blood and repugnant things. And with regards to their relationship between one another, they used to kill and fight one another over the most trivial thing. They neither had a leader nor a state. They were either under the authority of tribal systems or under the authority of the Persians and the Romans. The powerful used to encroach upon [the rights of the weak], and an oppressor used to transgress the limits, and no one stopped him. This was the state of affairs in Jaahiliyyah (The Pre-Islamic Period of Ignorance). ‘Hudaa’ is beneficial knowledge and ‘Deenul Haqq’ is righteous action. Allaah (Glorified be He and free is He from all imperfections] sent His Prophet [sallal-laahu-alayhi-wasallam] with beneficial knowledge and righteous action, so that pre-Islamic ignorance ceased to exist for ever and knowledge and guidance appeared. The ‘Jaahiliyyah Aamma’ [The Pre-Islamic ignorance that was widespread in the world and touched every aspect of life] has ceased to exist; but it remains amongst some people or some of the tribes, or in some of the lands. This is Jaahiliyyah Juz’iy [partial Pre-Islamic Ignorance]. As for the ‘Jahiliyyah Aamma’, this has ceased to exist after the advent of the Messenger [sallal-laahu-alayhi-wasallam], but some characteristics of Pre-Islamic ignorance remains with some of the people due to statement of the Prophet [sallal-laahu-alayhi-wasallam], ‘’Among my people there are four characteristics belonging to pre-Islamic period which they do not abandon: boasting of high rank, reviling other peoples’ genealogies, seeking rain by stars, and wailing (i.e. for the dead).’’ [reported by Muslim].” This remains, but it is an aspect of Jaahiliyyah. As for the Jaahiliyyah Aamma, it has ceased to exist. Therefore, it is not permissible to say that the people are in Jaahiliyyah (Pre-Islamic ignorance). Some [people] say: ‘’ [The people] are in a state of Pre-Islamic ignorance that is more severe than the one before the advent of the Prophet [sallal-laahu-alayhi-wasallam].’’ The meaning of this [statement of theirs] is a denial of what the Messenger [sallal-laahu-layhi-wasallam] brought – a denial of the Qur’aan, the Sunnah of the Prophet and the abundant knowledge within our hands. Its meaning is that we are in Jaahiliyyah [Pre-islamic ignorance]. This is a mistake, the people are not in Jaahiliyyah, but there remains some of the characteristics of Jaahiliyyah in some individuals- in some nations and tribes; but this is a specific Jaahiliyyah. Therefore, it is obligatory to be acquainted with this affair. What is Evil? Evil is that which the people were upon- shirk, worship of images, eating haraam and other evil deeds before the advent of the Prophet [sallal-laahu-alayhi-wasallam]. These were the evil deeds, but Allaah brought about good [through Islam]. Hudhaifah [radiyallaahu-anhu] said, ‘’And then Allaah brought us this good [time through Islam].’’ This is an acknowledgement of Allaah’s grace, for indeed good [only] comes from Allaah [The Exalted] and He is The One Who guided us. We cannot recognize Good [solely] through our intellects and the knowledge we possess; rather we come to know of it by way of the revelation given to the Messenger [sallal-laahu-alayhi-wasallam]- the Magnificent Qur’aan and the [authentic] Prophetic Sunnah. This is evidence that evil will appear after good, and these are the trials and tests Allaah will allow to appear amongst the people. Indeed they [the people] will not continue to be upon one state; rather they will face changing circumstances. The human being will not be safe from trials and doubts; he will not be safe from the callers to misguidance even if he is upon good, upon a correct creed and the correct Religion. That is why Hudhaifah asked: ‘’Is there any evil time after this good one?’’ He [sallal-laahu-alayhi-wasallam] said,” Yes.” This is Khabar [information] from the Messenger [Sallal-laahu-alayhi-wasallam] that evil will occur after the good Muhammad [sallal-laahu-alayhi-wasallam] came with. This [trial, test, etc] took place during the latter part of the era of the Sahaabah. Trials and evil have emerged from the misguided sects, such as the Qadariyyah, the Shia, the Murji’ah, the Jahmiyyah and other than them. This took place during the latter part of the era of the Sahaabah [radiyallaahu anhum]. However, as long as the Qur’aan and the authentic Sunnah are present, then indeed this evil will be repelled if the Scholars convey the Qur’aan and the Sunnah and clarify these trials and evils for the people. Therefore, the cure is present -all praise and thanks be to Allaah-and evil will be repelled. [A person] should not lose hope when trials and evil increases. Indeed, he should be in a state of tranquillity and should encourage others to be in a state of tranquillity when trials occur, and he should say: ‘’All praise and thanks be to Allaah, we are upon guidance and a clear Religion. Solace is close by and evil will cease to exist by the permission of Allaah’’ This is what is incumbent upon THE PEOPLE OF GOOD AND THE SCHOLARS-that they have tranquillity and [urge] the people to be in a state of tranquillity; because this (EVIL) is something that will cease to exist by the permission of Allaah and solace will come after it. This is the wisdom behind the occurrence of trials and tribulations, so that the believers are purified, and so that they exercise patience, become firm upon the truth and are cautioned for their mistakes, and in order that they may repent to Allaah [The Mighty and Majestic] and [so that] the disbelievers in Allaah are destroyed. Therefore, [trials and tribulations] is purification for the believers and destruction for the kuffaar and all praise and thanks be to Allaah. It is obligated on the Muslim that he looks at [the affairs] with optimism-neither looks at history and the state of affairs with pessimism and hopelessness nor make the people lose hope. It has been reported in a hadeeth: ‘’Whoever says, ‘the people are ruined, then he himself is ruined.’’’ [Muslim] Therefore, a person should neither lose hope in Allaah’s Mercy nor does he make people lose hope that Allaah will bring about solace. In this is evidence that one should expect solace and should not despair of Allaah’s Mercy. Indeed, good will come after evil. The Muslim should neither despair nor lose hope; [rather] he has to wait for Allaah’s Solace. However, this has to be accompanied by what one is able to perform of actions, statements, spreading knowledge, calling to Allaah, telling the people to have certainty [in the affairs of the Religion] and keeping them away from despair and lack of hope. He [the pessimist] says: Islaam and the Muslims have vanished, the affair has ended, and the Religion has been annihilated…..and so forth….. These are maqaalaat sayyiah [evil statements]. And regarding his (sallal-laahu-alayhi-wasallam) statement: ‘’But therein will be a hidden evil’’-Meaning: There will be something of alteration [i.e. 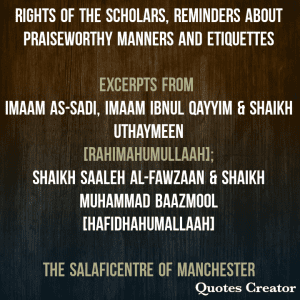 things that are not in conformity with the Sunnah and guidance of the Messenger] during that good time. It is a [good time] but there would be something of alteration in it. This is information given by the [truthful one, the one who is believed- sallal-laahu-alayhi-wasallam], and indeed good has occurred along with something of alterations. [Hudhaifah] said, ‘’What will be the evil hidden therein?’’ Subhaanallaah! This man is precise [in the manner] he presents his questions, and Allaah made him utter that which is of benefit and education for the ummah. He [sallal-laahu-alayhi-wasallam] said: ”(that time will witness the rise of) people who will follow ways other than mine and they will seek guidance other than mine.’’ Meaning: They will have affairs that are not (in conformity with the Sunnah and guidance of the Messenger Muhammad). They are Muslims and believers who possess good, but they will (also) have something of those things that are not (in conformity with the guidance of the Messenger), which will not terminate their Eemaan and religion; but it will make it deficient. Likewise, there will be deficiency in the worldly affairs. And it [has been reported in another] hadith: ‘’No time will come upon you but the time following it will be worse than it, till you meet your lord.’’ So, they will have some things that are in (opposition to the Sunnah and the guidance of the Messenger-sallal-laahu-alayhi-wasallam) and they will seek guidance other than that of Prophet [sallal-laahu alayhi-wasallam]. They will initiate things in opposition to the Sunnah, however it will not be a complete opposition; rather it will be a specific type of opposition. In this is a warning against opposing [the Sunnah] even if that is little. 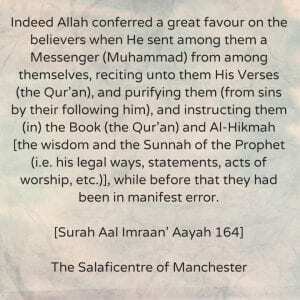 In this is a warning against seeking guidance other than that of the Prophet [sallal-laahu-alayhi-wasallam] even if that is little; because the Prophet [sallal-laahu-alayhi-wasallam] referred to it as Dakhan- Meaning: ‘Deficiency and Harm.’ And in this is evidence that the judgment of disbelief is not passed on the Muslim as long as he does not commit Major shirk or apostates from Islaam through one of the nullifiers of Islaam. [Ref 2] However, he may have some affairs of deviation and some affairs that are not in accordance with the (Sunnah). This either makes him one who is mistaken and misguided or a sinner due to committing a sin which does not expel him from the fold of Islaam. So, in this is a fundamental principle from the fundamental principles of Aqeedah, and that is the judgment of disbelief is not passed on the one who commits a major sin; rather this is called Dakhan (hidden evil) and Naqsan (deficiency) in Religion, or sin; but it is not called disbelief and apostasy from the Religion as the Khawaarij and Mutazilah say. He [sallal-laahu-alayhi-wasallam] said [to Hudhaifah]: ‘’You will know (their) good points as well as (their) bad points.” You will know the good points of these people and this is evidence that they will possess good. And you will know their bad points, and this is evidence that they will have something of evil, which will be in opposition to the guidance of the Messenger [sallal-laahu-alayhi-wasallam]. They will possess both good and evil. The Messenger [sallal-laahu-alayhi-wasallam] referred to [that particular period] with good and attested to it, and this is evidence [showing that] that [particular period] is good even if there is a hidden evil in it. And in this is proof of the Creed/Methodology of Ahlus Sunnah Wal Jamaa’ah regarding the fact that not every matter that is in opposition to the Prophet’s guidance is disbelief; rather such (opposition) may be an error, or misguidance or deficiency in Eemaan, and it can also be called evil. There is a differentiation regarding evil, and from that is ‘Absolute Evil’, ‘partial evil’ and evil that is compared [with other evil things]. Therefore, we must name the things with their appropriate names. This is the third time when evil will occur, but it will be greater than the first time. In the first evil (period), the people possessed both good and evil. However, these ones (a particular type of people who will be present during the third occurrence of evil) will be callers to the gates of hell fire. They do not say to the people, ‘’Come to the hell fire! !’’; [rather] they say: ‘’Come towards progression and civilization (as opposed to the old lifestyles), towards development and conformity with the nations. Do not remain old fashioned and rigid.’’ The meaning of this is: Abandon your religion and go along with the people. These (people) are callers to the gates of hell fire-they call (the Muslims) to abandon their religion and affiliate themselves to the disbelievers. This is the call to the hell fire because the hell fire is a promise for the disbelievers. They call the people to that which the people of hell fire are upon – the disbelievers, the idolaters and the atheists. How numerous are these callers in the Islamic World today! Laa Hawla Walaa Quwwata Illaa Billaah! And how did he call them to the Paradise and how did they call him to the fire? This is the difference between the callers to good and the callers to evil. Indeed, the callers to good invite to [the path of] Allaah-to His Religion and Paradise; and the callers to evil invite to the hell fire. [The callers to evil] do not say to the people, ‘’Come to the fire! !’’ They say, ‘’Come to Paradise, these are the actions of the people of Paradise, this is good, this is development, this is rectification, this is and this is….’’ and they beautify that for the people. Therefore, the Muslims must be cautious of these people. 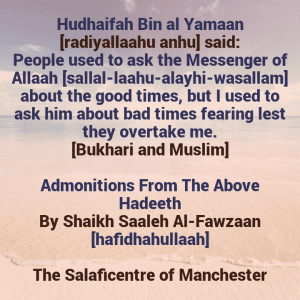 Indeed, they have become numerous in this era, and Allaah knows best whether they will increase in the future. They may be facilitated with tools [of misguidance] which were not possessed by the previous callers to misguidance and are given firm support through such (tools), and this misguidance will rapidly reach the people. The suggestion of the seducer and the falsifier will be adorned and made to appear as something good to the people in any place, whilst it is something evil. This is the height of fitnah. This is a description of the callers to misguidance, their methodologies and objectives. 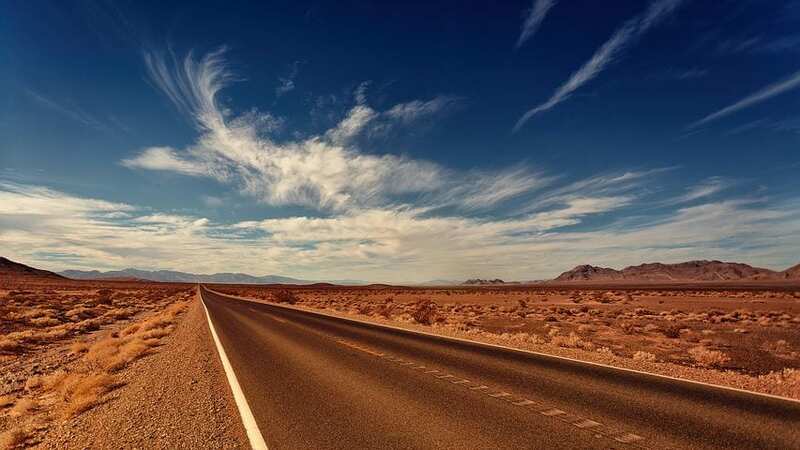 It has been thoroughly illustrated for us that indeed whatever opposes the Straight Path is a path leading to Jahannam, and whoever abandons the Straight Path is heading towards the Jahannam, even if he regards himself civilized, progressive and open minded. They possess eloquence that overwhelms the listener. The listener listens to them because of their eloquent speech. The Prophet [sallal-laahu alayhi wasallam] said: ‘’Indeed some eloquent speech has the influence of magic’’ [i.e. some people refuse to do something and then a good eloquent speaker addresses them and then they agree to do that very thing after his speech] [Bukhari Vol 7. Hadith No: 5146]. They speak with our tongue (i.e. the Arabic tongue). Had they spoken with a foreign language or the language of the Persians, there would not have been inclination towards them, but the problem is that when they speak with eloquent speech, the people are lured towards them. This is the height of fitnah. In this is a clarification regarding what the Muslim must do when these trials occur and the evils by way of which people are called to deviation, decadence, agreement with the disbelievers and abandonment of Islaam and its rulings. Indeed, the Muslim is not deceived by them, rather he stays with the Jamaa’ah of the Muslims. He sticks to the Jamaa’ah of the Muslims and does not separate from them- neither by way of opinions and beliefs nor statements. He is not deceived by speech and what is falsely made to seem desirable; rather he looks at what the Muslims [who are holding onto Qur’aan, the authentic sunnah and example of the sahaabah] are upon. The Prophet [sallal-laahu-alayhi-wasallam] said: ‘’My ummah will not agree upon misguidance.’’ And he [sallal-laahu-alayhi-wasallam] said: ‘’It is obligated on you to adhere to the Jamaa’ah, for indeed the Hand of Allaah is over the Jamaa’ah.’’ [Tirmidhee] So be with the Jamaa’ah of the Muslims. [Hudhaifah] said: ‘’What if they have no (such thing as the) main body and have no leader?’’ This honourable Sahaabi does not stop asking the Messenger [sallal-laahu-alayhi-wasallam] questions that contain great benefits for the ummah. He [sallal-laahu-alayhi-wasallam] replied: ‘’Separate yourself from all these factions though you may have to eat the roots of trees (in a jungle) until death comes to you and you are in this state.’’ In this is evidence [that one is to abandon] all the groups that are in opposition to that which the Messenger [sallal-laahu-alayhi-wasallam] came with, and that which the Salaf of this ummah and their Imaams were upon, and that which the Jamaa’ah of the Muslims are upon. In this is evidence that what is given consideration are one’s FINAL ACTIONS. Indeed, the one who isolates himself from trials, stays firm upon the truth and exercises patience when facing trials until death comes to him in this state, then indeed he will be from the people of Paradise [InShaaAllaah]. And the one upon whom death comes to whilst he has changed and substituted (the truth, his religion etc) and followed the callers to misguidance, then indeed he will be from the people of hell fire [i.e. if he leaves the fold of Islaam; but if he dies upon other than major shirk or kufr, he is left under the will of Allaah, who will either punish or forgive him]. These are the few statements [mentioned] regarding this tremendous hadith. It clarifies the dangers that are an obstacle to the ummah in their [path, religion]. In it is clarification regarding what is binding upon a Muslim during trials and that which is obligated on him in relation to adhering to the Jamaa’ah of the Muslims and their Leader, the Salaf of this ummah and their Imaams. All praise and thanks be to Allaah, Lord of the Aalameen, and may Allaah’s peace and blessings be upon our Prophet [Muhammad], his family and all his companions. Question: O Respected Shaykh, who is the murtadd (apostate)? We hope for you to define it in a clear manner, for sometimes the judgement of apostasy can be made upon a person while there is some doubt that he had. Shaykh Salih al-Fawzaan: The judgement of apostasy and expelling someone from the religion is only appropriate for the people of knowledge who are firmly grounded in knowledge, and they are the judges in the various Sharee’ah law courts, and those who are able of giving legal verdicts. And this is just like the other matters, and it is not the right of every person, or from the right of those who are learning, or those who ascribe themselves to knowledge, but who have deficiency in understanding. It is not appropriate for them to make judgements of apostasy (upon others). Since, mischief will arise from this, and sometimes a Muslim might be judged as an apostate, but he is not actually so. And the takfir of a Muslim who has not committed one of the nullifications of Islaam contains great danger. Whoever says to his brother O Kaafir or O Faasiq, and he is not like that, then the words will fall back upon the one who said them. Hence, the ones who actually judge with apostasy are the legislative judges and those who are able and fit for giving legal verdicts. And as for those who enforce the judgements they are the leaders of the Muslims (wullaat al-amr). As for whatever is other than this, then it is mere confusion. Question: Some of the students of knowledge are a bit lax towards applying the word of apostasy (riddah) to a Muslim, and this person might sometimes be asked by the Muslims to carry out the hadd punishment for apostasy when the Sultaan does not carry it out upon the one they consider deserves it, the one who has been judged with apostasy. Shaykh Salih al-Fawzaan: Meting out the punishments is only appropriate for the leader of the Muslims and it is not for every person to establish the punishment, since confusion, and corruption necessarily follows from this, and also the cutting off of the society, tribulations and provocations occur. Establishing the punishments is appropriate (i.e. befits only) to the Muslim leader. The Prophet (sallallaahu alaihi wasallam) said, pardon each other for the punishments that are between you, but when the execution of the punishment reaches the [authority of the] Sultaan, then Allaah curses both the one who seeks intercession and the one who grants the intercession [i.e. to revoke the punishment]. And from the responsibilities of the Sultaan in Islaam, and from those matters that befit him is the establishment of the punishments after they have been established legislatively, via the Sharee’ah law courts, upon the one who fell into the crime for which the legislator has designated a specific punishment, such as for stealing. So, what has been said is that establishing the punishments (i.e. meting them out) is from the rights of the Sultaan, and when the Muslims do not have a Sultaan amongst them, then they should just suffice with commanding the good and forbidding the evil, and calling to Allaah, the Might and Majestic, with wisdom, good admonition and arguing with that which is best. And it is not permissible for individuals (in the society) to establish the hudood, since that, as we have mentioned, will bring about chaos, and also provocations, and tribulations will arise, and this contains greater corruption than it contains rectification. And from amongst the Sharee’ah principles that are submitted to is, Repelling the harmful things takes precedence over bringing about the beneficial things. Ref A: What is Al-Jaahiliyyah? Shaikh Saaleh Al-Fawzaan [may Allaah preserve him] said: Al-Jaahiliyyah: It is derived from al-Jahl (ignorance). It is an absence of knowledge, and the intent behind it is the before Islaam. The before the advent of Muhammad (sallal-laahu-alayhi-wasallam) is (referred to as) Jaahiliyyah because they were in ignorance and misguidance in the affairs of worship, dealings, food, drink, marriage and other than that. They were in ignorance and misguidance due to the long period between Eesaa and Muhammad (i.e. the absence of a messenger). This was a period of over four hundred years during which the divine message stopped. The divine message was obscured, and ignorance and misguidance became widespread. The people worshiped idols, trees, stones, false deities, the Jinn and humans. They worshiped the Angels, the Awliyaa and the righteous people, and they were upon divergent paths with regards to acts of worship. And with regards to the affair of halaal and haraam, they did not distinguish between good and filth; rather they used to deal with usury. The Ribaa Al-Jaahiliyyah (The Pre-Islamic Usury) was: When they used to settle a debt with a debtor, they would say: either you settle the debt, or we increase the debt and double the time it (should be paid). This was the Pre-Islamic Usury and it used to be predominant in their dealings. They used to gather wealth through forbidden means–through pillage, plunder, robbery and devouring people’s wealth through falsehood. And with regards to food, they made dead animals and blood lawful; they used to eat dead animals, blood and repugnant things. And with regards to their relationship between one another, they used to kill and fight one another over the most trivial thing. They neither had a leader nor a state–they were either under the authority of tribal systems or under the authority of the Persians and the Romans. The powerful used to encroach upon (the rights of the weak), and the oppressor used to transgress the limits, and no one stopped him. ‘Hudaa’ is beneficial knowledge and ‘Deenul Haqq’ is righteous action. Allaah (Glorified Be He) sent His prophet (sallal-laahu-alayhi-wasallam) with beneficial knowledge and righteous action–so with the sending of the Messenger (sallal-laahu-alayhi-wasallam) Jaahiliyyah (pre-Islamic ignorance) ceased to exist for ever walil-laahil Hamd, and knowledge and guidance arrived. The ‘Jaahiliyyah Aamma’ (The Pre-Islamic ignorance that was widespread in the world and touched every aspect of life) has ceased to exist; but it remains with some people or with some of the tribes, or in some of the lands. This is Jaahiliyyah Juz-i (a portion of Pre-Islamic Ignorance), (but) as for the ‘Jahiliyyah Aamma’, this has ceased to exist with the sending of the Messenger (sallal-laahu-alayhi-wasallam), but some characteristics of Pre-Islamic ignorance remain with some of the people due to saying of the Prophet (sallal-laahu-alayhi-wasallam): ”Among my people there are four characteristics belonging to pre-Islamic period which they do not abandon: boasting of high rank, reviling other peoples’ genealogies, seeking rain by stars, and wailing (i.e. for the dead)’’ (reported by Muslim).” This remains, but it is a portion, (but) as for the Jaahiliyyah Aamma, it has ceased to exist. 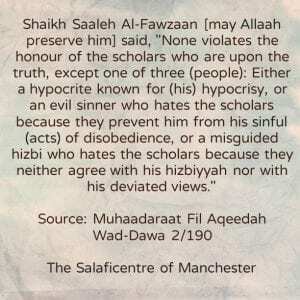 Shaikh Saaleh Al-Fawzaan [may Allaah preserve him] said, ”None violates the honour of the scholars who are upon the truth, except one of three (people): Either a hypocrite known for (his) hypocrisy, or an evil sinner who hates the scholars because they prevent him from his sinful (acts) of disobedience, or a misguided hizbi who hates the scholars because they neither agree with his hizbiyyah nor with his deviated views”. 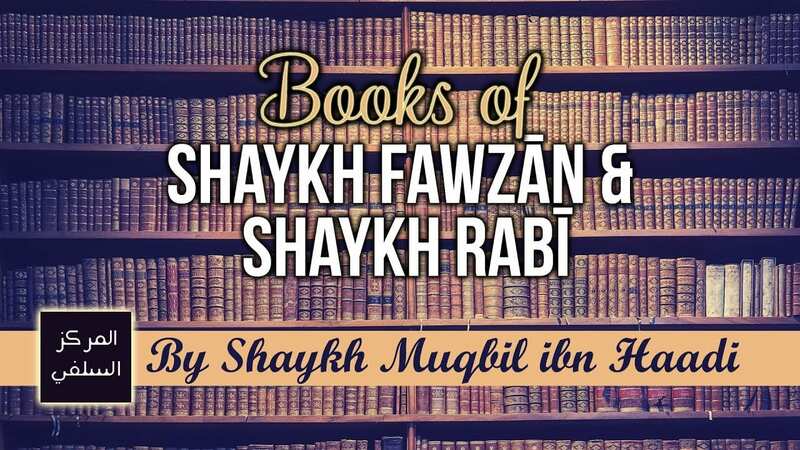 What is your opinion regarding the books of Shaykh Sālih Al-Fawzān and Shaykh Rabī ibn Hādi Al-Madkhalī? Watch the video for the answer of the Shaykh!